1Xiaomin Liu, Feng He, and Huagang Xiong are with the School of Electronics and Information Engineering, Beihang University, Beijing 100191, China. 2George N. Rouskas (e-mail: rouskas@ncsu.edu) is with the Department of Computer Science, North Carolina State University, Raleigh, North Carolina 27695-8206, USA, and with King Abdulaziz University, Saudi Arabia. We present a simple yet effective enhancement to the operation of the Ethernet passive optical network (EPON) multipoint control protocol (MPCP) for wavelength division multiplexing (WDM) EPON. The enhancement, inspired by our earlier work in a related but different context, allows the optical line terminal (OLT) to perform look-ahead scheduling on each of the upstream channels. 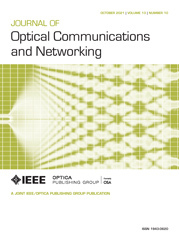 The look-ahead operation is fully compatible with the existing standard and may be implemented via software updates to the OLT without affecting the operation of optical network units in EPON. The look-ahead enhanced MPCP achieves significant performance gains across a wide range of traffic loads and opens up new opportunities for the design of sophisticated dynamic bandwidth algorithms to support advanced quality of service capabilities.